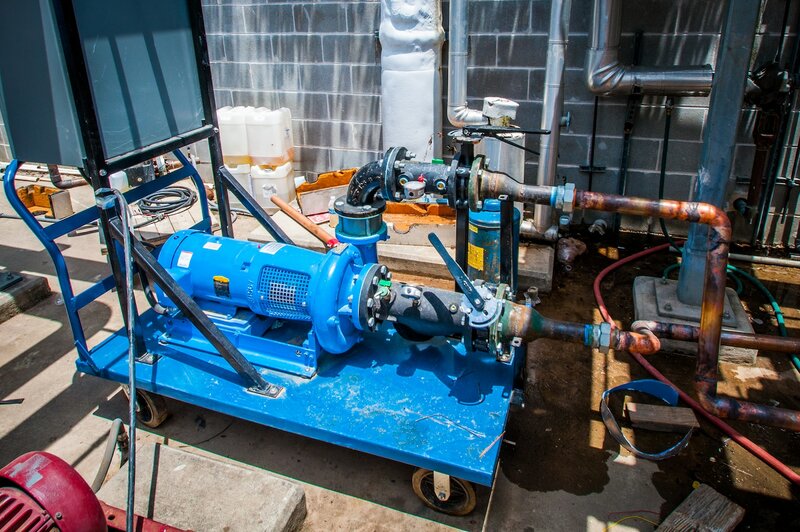 It is our goal to get your building back up and running as soon as possible; our rental experts are available 24/7 to help you select the right rental pump for your application and get it on site immediately. We will coordinate delivery to the site with lift gate service (price included in Rental Service Charge, Houston Area only). We do not provide installation services, however we do have Authorized Service Providers (ASPs) that than can offer a turnkey solution. More information on the ASPs can be found here: Cougar Rentals ASPs. Once installed, Cougar Sales will start up the Rental Pump and provide training on the operation of the unit (Houston Area Only). Many older pump systems are not sized correctly, use inefficient pumps for pressure boosting, and have outdated controls. Leveraging our experience in the Retrofit market, we can select the right pump package for your building that will provide constant pressure very efficiently, easily reducing energy consumption by 50% and in some cases 75% or more. Grundfos has a BoosterpaQ Quick Ship Program which means most systems are either in stock at the factory or can ship in 2-4 weeks. 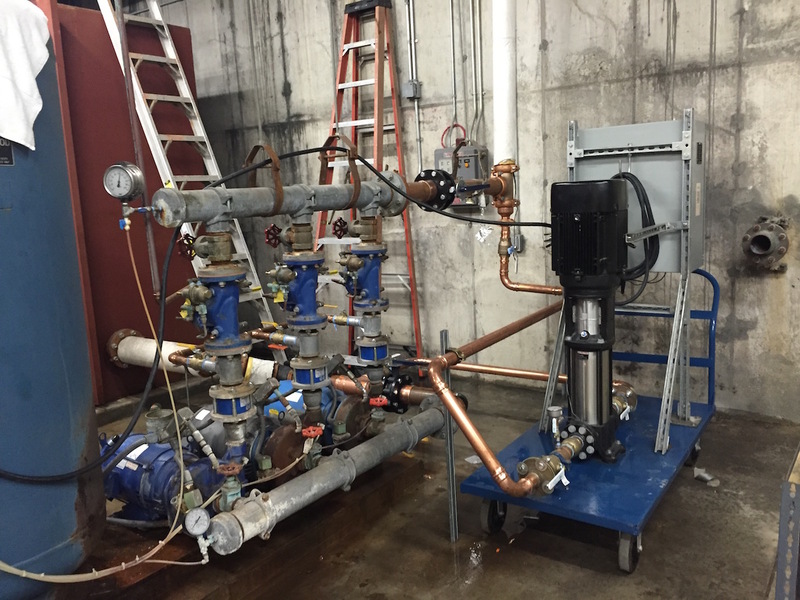 The use of our rental pumps makes the installation of a new Grundfos BoosterpaQ much smoother. 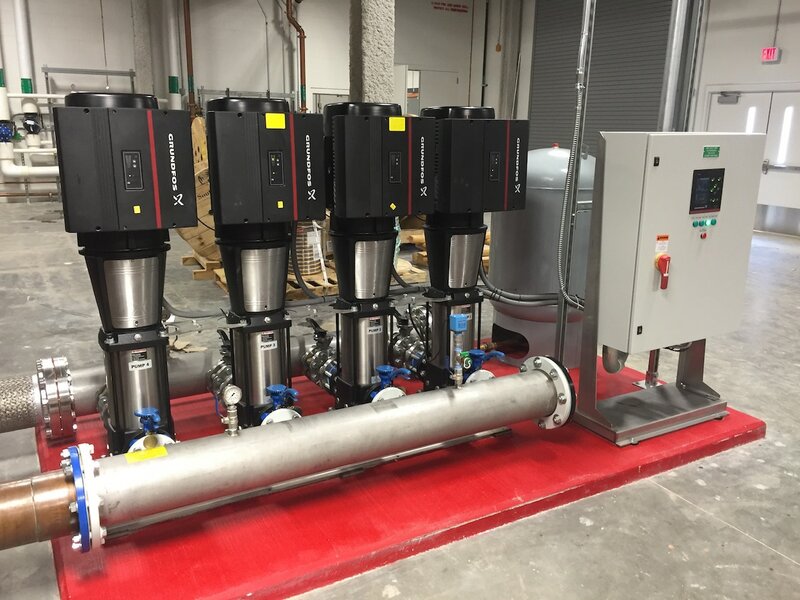 The existing package can be removed and the new BoosterpaQ installed, all while the rental pump provides water for the building and cooling tower make up. Once the new system is online, we will coordinate pick up of the rental pump from the site with lift gate service (price included in Rental Service Charge, Houston Area only). As with the Domestic Boosters, we will coordinate delivery to and from the site as well as perform start up (price included in Rental Service Charge, Houston Area only). The Flushing Skids are selected based on the flushing velocity required in the system. We have run calculations for maximum pipe velocities based on schedule 40 steel pipe and an estimated system head requirement; this information can be found on the specific product pages. Please use these calculations as a guide only, they are not guaranteed performance as each system is different. The controller used on the Flushing Skids is capable of very accurate flow estimation without the use of a flow meter. If a data log is required we can provide this after the rental in an excel file.